You’ll find tons of leaked ad scans on Black Friday-focused websites such as bfads.net, bestblackfriday.com, gottadeal.com, andtheblackfriday.com. Some of these let you filter your searches by product category. Section A – What can Pavtube BDMagic for Windows do for you? Pavtube BDMagic enables you to personalize Blu-ray/DVD movies before converting to get more enjoyment, including: file merging, media editing, 3D movie creating, parameter adjusting, etc. You could make movie with your own patent easily. Besides, you can convert 2D Blu-ray, 3D Blu-ray and standard DVD to SD, High-Definition formats or even create 3D videos with excellent video/audio quality in fast conversion speed. Just share your Blu-ray collections on numbers of popular media players including TV. * This Blu-ray Ripper could rip Blu-rays and DVDs released by all movie studios like 21st Century Fox, Columbia Pictures, MGM, Paramount Pictures, RKO Radio Pictures, United Artists, Warner Bros., Disney, Universal Pictures, etc to popular audio and video formats for you to enjoy the movie on PC and wide screen TV. Learn >> Blu-ray Solutions. * Support output to PS4, Xbox One S, Apple TV 4, WD TV player, iPad Pro, iPad Air 3, iPhone 7, iPod touch 6, Galaxy Tab S2, Nexus 9, etc. * More than 200 formats listed to ensure you can get the desired video and audio types, like m3u8, Prores, H.265 MP4, H.265 MKV, MKV, AVI, MP4, WMV, FLV, MPEG, MOV, RMVB, FLAC, AAC, AC3, AIFF, AMR, M4A, etc. 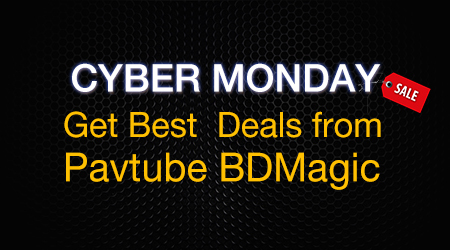 Ready Free Try or Buy Pavtube BDMagic for Windows? Hope you be a No.1 shopper! Note: For more detailed information, please join our Facebook Community to get the best Pavtube software deals for 2016 Black Friday.